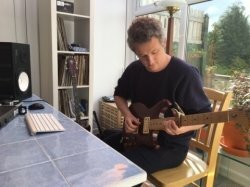 Tom offers a FREE first / introductory lesson! I am a professional guitarist, composer and guitar teacher based in Chesham, Buckinghamshire. I’ve been composing music for various media for over 20 years and have had many syncs and cues used worldwide with numerous music libraries including West One, KPM, Inspired, Alibi, Pedigree Cuts, Standard, NPM, Altitude, Gargantuan and others. In that time I have composed and released over 700 individual pieces of music as well as co-writing music with many commercial artists including Finley Quaye, David Crosby, A Guy called Gerald, Tiesto, Psychemagik, Carlos Bess (Wu-Tang), Osibisa, Skeewhiff, Hybrid, The Master Drummers and many more. My music can be heard on all manner of television programmes all the way from from ‘Countryfile’ to ‘Panorama’. I also won a Fuji award for best soundtrack for the 1999 film ‘Great Falls’. I have enjoyed a long and successful career in music and now find teaching guitar the most fulfilling part of my work. I teach electric guitar, acoustic guitar, bass guitar, ukulele and also composing, recording and production. I find that helping people to sound great as quickly as possible makes learning the guitar more enjoyable, theory is then introduced as we advance. If you already know your theory then I am more than happy to just focus on technique. I teach adults, children and groups. Students are advised to arrive five minutes early to settle down and have a cup of tea/glass of squash. Biscuits are provided. First Lesson is free. Students are welcome to bring parents/partners/friends/children to the lesson. I have two teenage kids and have leaned how to approach teaching other kids through them. The key is that they absolutely have to enjoy themselves! I've been teaching guitar for 15 years. In that time I've never had an unsatisfied pupil. I've taught all ages and all levels of experience. In my view, if you can take an MP3 with you so that you can listen to yourself playing, you teach yourself. I have professional studio equipment and record everything in my studio. I make a backing track from scratch with each student to play over. After each lesson students take an MP3 of their best takes and an MP3 of the backing track for them to improve over. Practice is the key. The only real way to make breakthroughs is to play – something you like. When students compose to a high standard, I can professionally record them. If students simply want to spend the lesson recording themselves, then that is absolutely fine. My students learn to improvise, record, produce and compose, building a repertoire of techniques that give them the ability to express themselves and, above all, make the sound they really want to make. TomFrom Suki (5/5): Sam is loving learning guitar with Tom. Tom is supportive and encouraging and records Sam's playing, which helps him to hear how he is getting on and how he can improve.